Blue cheese-stuffed olives make an easy but elegant appetizer, and they are phenomenal in a martini. Canned varieties can be grainy, the body of the blue cheese being sacrificed for convenience. Making your own blue cheese-stuffed olives is simple with a few easy steps. 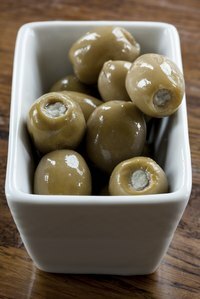 Look for pitted queen olives, which are large in size and come unstuffed and ready to go. Drain the olives and pat them dry, using a small fork or toothpick to remove anything from the middle if they were previously stuffed. If the olives have pits, use an olive pitter to remove the pits. Mix crumbled blue cheese with about one-fourth the amount of cream cheese or Greek yogurt in a small bowl. Use hand beaters at medium speed and whip until the mixture achieves a creamy consistency, adding more yogurt or cream cheese if necessary. Scoop the cheese mixture into a piping bag fitted with a large tip. Pipe the filling into the olives. Store them in an airtight container in the refrigerator for up to four days. Alternatively, don't use cream cheese or yogurt and simply work the blue cheese crumbles between your finger tips. Pack the crumbles firmly into the hole of each olive. Store the olives in an airtight container in the refrigerator for up to four days. If the blue cheese is a firm variety, cut it into 1/2-by-1/4-inch strips and stuff them into the olives. For a twist, add a sliver of garlic or jalapeno to the mix or sprinkle the finished olives with finely chopped herbs. If you are piping the filling, do not mix in too much yogurt, because its soft texture can yield undesirable results.